Varondo is a medium-sized Ayleid ruin north of Kvatch containing conjurers and daedra. It contains three zones: Varondo, Varondo Beldastare, and Varondo Varlasel. Despite unimpressive outside looks, the ruin has a massive interior. Because of the convoluted, multi-level layout, you will generally be detected by many enemies at a time, who will all group up in various areas and attack you. The conjurers summon daedra in addition to the ones that crawl the mazes already and It can be very hard to single out individual enemies as a result. This is one of the few areas in Tamriel that has Dremora spawns, starting at level 5. This location's map marker (M on map) is named Varondo (editor name VarondoMapMarker). The entrance door is W of the marker, 110 feet away. As soon as you enter, you will see door D to the third zone on your left. However, this is the door used to return after exploring the dungeon. It is blocked by a gate (F on map) that can only be opened from the other side. Although both this gate and gate H claim that they "require a key" to be opened, there are actually no keys to either of these gates. They are opened by stepping on the activation plates in front of them. This zone contains one boss chest, however it is easily possible to miss it. From the first, square room, you have two main options for how to get through the rest of this zone. 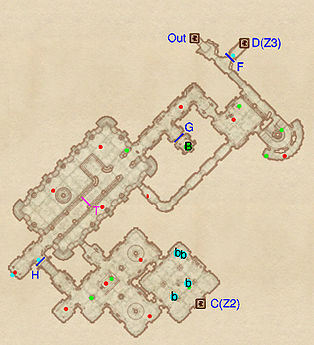 If you choose to take the lower level route through (taking the southern passage), you will end up at door C to the second zone without even passing the boss chest, and you are unable to open the gate at H from this direction. If you take the upper level route, north from the square room, the boss chest is at first inaccessible because of the gate at G. To open the gate you need to make your way past the rare Spiked Barrier trap (T). 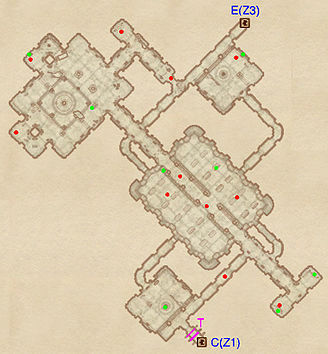 At the far southwest end of the passage is a "push block" (cyan dot on map) that opens gate G.
1 boss-level Chest (Conjurer variety; locked) at location B on map. 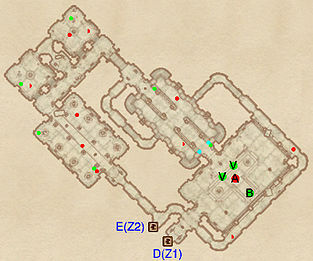 10 Welkynd Stones, all on the lower level of the large room at T.
1 Spiked Barrier trap at location T on map. It is possible to avoid any damage from this trap by stepping into the side area on the north side of the passage. Don't jump down, because then you will miss the switches at the far end that open the gates at G and H.
1 door (at D) leads to the zone Varondo Varlasel. This door can only be accessed after you have already been to Varondo Varlasel. It provides a shortcut to return from the end of the dungeon. 2 Gates at F and H (both locked, says 'key required' but there is no key). Each of these gates is opened by stepping on the activation plate in front of the gate (indicated by the cyan dots on the map). 1 Iron Gate (opened remotely) at G. The activation switch for this gate is at the far (SW) end of the passage (shown by the cyan dot on the map). You will enter this room using door C from the first zone, and exit through door E to the third zone. Other than the two Swinging Blade traps (T) when you first enter, the main obstacle to getting through this zone is its size and maze-like layout. As with the first zone, there are two main ways through, one at the upper level (following the main diagonal passage from southeast to northwest), and the other at the lower level (taking the stairs down in the southeast corner). 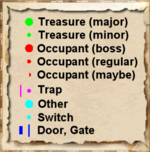 To get all the treasure, you will need to explore both paths and follow a few dead-end passages. 7 Welkynd Stones, all in the northwest room. You will enter using door E from the second zone. Returning through door D provides a short cut straight back to the entrance in the first zone. 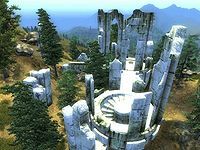 This zone contains most of the valuable loot in the ruin, namely the two Varla stones (V) and the boss-level Ayleid cask (B). The fastest way through is to take a right from the door at E and jump down into the main room with all the loot. However, to open the Varla cages you will need to circle through some of the rest of the dungeon. 2 Varla Stones (both in Varla Stone Cages) at V. The activation switches for the cages are located in the next room to the northwest, on its southeast wall (the cyan dots on the map). They are at the lower level of the room; the fastest way back up to the Varla Stones is to take the passage from the southwest side of the room and loop around. 12 Welkynd Stones. Eight are in the western room (the first room north of door D) and four are in the central room with the Varla stone activator switches.